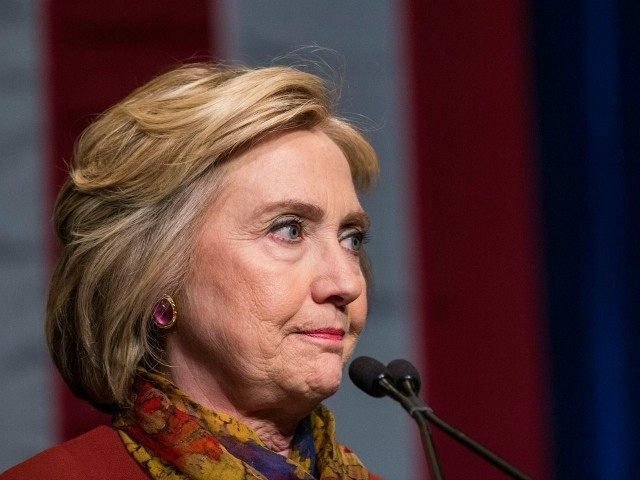 Former Secretary of State Hillary Clinton has badly underperformed in 2016 compared with her first run for president in 2008, a new data analysis done exclusively by Breitbart News shows. Clinton is widely expected to be the Democratic nominee in 2016, but her poor performance in the primaries—which many believe she should have wrapped up long ago—may drag her down heading into the general election, as even many Democratic voters seem to distrust her. To win in November, Clinton will need a strong showing from the Democrat base. This data seems to suggest that she has significant problems with her own party’s core voters, meaning that if whoever wins the Republican nomination is able to woo these disaffected Democrats into the GOP camp, there could be a blowout in November for the Republican nominee. In 2016, Clinton has received 12,437,734 votes so far. In the states that have already voted this cycle, when she ran and lost back in 2008, Clinton received 12,727,221 votes. Specifically, the data shows, Clinton has seen a decline of 273,321 votes from 2008 to 2016 among states that have already voted this cycle. That 2.15 percent decrease nationally is exacerbated in several key states that Clinton would need to win to secure the presidency in a general election, suggesting that she’s extraordinarily weak on the electoral college scale nationally—and that whoever wins the GOP nomination will likely be able to thump her in the general in November. This year, Clinton has seen declines versus her own 2008 vote totals in the following states: Ohio, Pennsylvania, Wisconsin, Nevada, Washington State, Arkansas, Massachusetts, Missouri, New Hampshire, New York, North Carolina, Oklahoma, Rhode Island, Tennessee, Texas, Utah, Vermont, Wyoming, and Alaska. While some of those states are deep red Republican states in presidential elections — like Arkansas, Texas, Utah, Wyoming, Alaska, and Tennessee — most of them are blue states or purple states. Blue states, where Democrats are usually expected to win easily but Clinton has seen a drop off in her 2008 versus 2016 vote totals include Rhode Island, New York, Massachusetts, state Washington and Vermont. Purple states, where both parties have a shot pretty much every time but where Clinton has crashed compared with eight years ago include Pennsylvania, Ohio, North Carolina, Wisconsin, Missouri, and Nevada. In some of those states, the Clinton crash has been significant. Ohio, for instance, has seen her lose nearly 45 percent support from 2008. Back then, Clinton got 1,259,620 votes. In 2016, only 696,681 people voted for her. That is a 44.69 percent drop off in the critical general election state. In Rhode Island and Massachusetts, two northeastern states that billionaire Donald Trump has won in the GOP primary, bottomed out their support for Clinton between 2008 and 2016. Back in 2008, 705,185 Massachusetts voters backed Clinton in the Democratic primary. In 2016, nearly 100,00 fewer voted for her—with only 606,822 voting for her, a 13.95 percent decrease. Missouri saw Clinton drop from 395,185 votes in 2008 to just 312,285 in 2016—a slide down of 82,900 votes or 20.98 percent. New Hampshire, another battleground state, saw 112,404 vote for Clinton in 2008 but just 95,324 back her in 2016. That is a fall of 17,080 votes, or 15.2 percent. In the critical battleground state of Pennsylvania, Clinton is down 38.97 percent or 89,037 votes. Even New York, where Clinton won last week in a victory that seemed to mark the beginning of the eventual end for Bernie Sanders, Clinton saw a 2.26 percent decrease from 1,068,496 in 2008 to 1,044,299 in 2016. That’s especially significant since New York state elected Clinton to the U.S. Senate after she was First Lady of the United States in the 1990s when her husband Bill Clinton was president. There are four caucus states—Iowa, Nevada, Maine, and Washington—where Democrats don’t report final vote totals for turnout or official total votes per candidate, but only report percentages per candidate and delegate totals. In those states, Breitbart News calculated an estimate of Clinton’s vote totals based off the percentages the parties report and the reported or estimated voter turnout as contained in a previous Breitbart News data analysis. In addition, the state of Utah switched from holding a Democratic primary in 2008 to holding a caucus in 2016—so that likely affected the turnout for Clinton as much as it affected the state’s Democratic turnout overall. What’s more, the five states that voted this Tuesday—Connecticut, Rhode Island, Delaware, Pennsylvania, and Maryland—do not yet have final, certified vote totals so those numbers may change in the coming days and weeks but not by much. 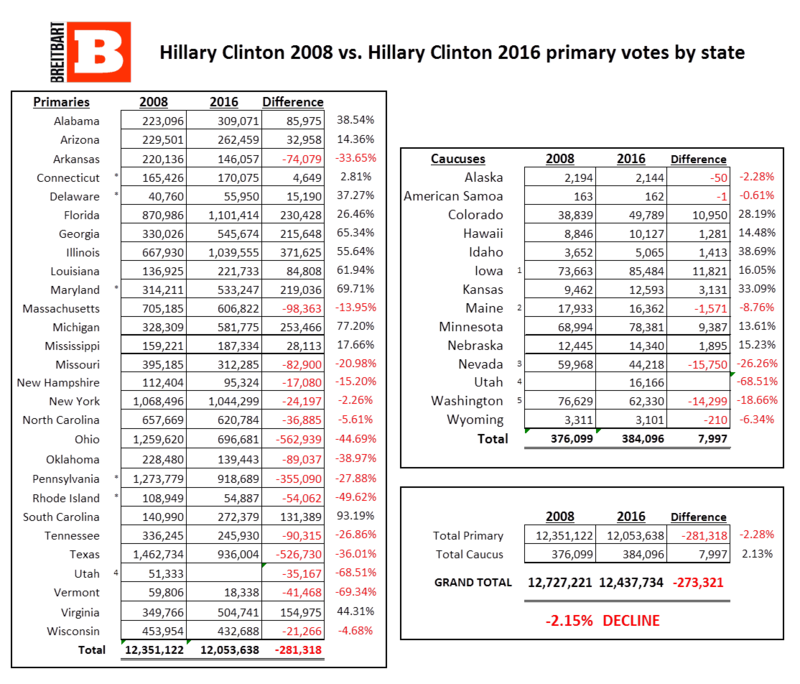 This is the fourth in a multi-part series in Breitbart News’ election metadata analysis. The first examined a massive spike in GOP primary turnout in 2016. The second walked through how Mitt Romney, in 2012’s GOP primary, received about 2 million fewer votes in states that have already voted than 2016 GOP presidential frontrunner Donald Trump. The third walked through how Democratic primary turnout has collapsed in 2016 versus 2008. More data is on the way. The U2 musician said that he sees a “lot of dishonesty” in modern Christian music. When U2 musician Bono reads the Psalms, a book of the Bible filled with ancient hymns, he sees the full range of human emotions: anger, irritation, sadness, bliss. While the Psalms have been a source of spiritual inspiration for himthroughout his life, Bono has much harsher words for contemporary Christian music. Modern Christian worship music has often been critiqued for its mediocrity — the repetition of the same four chords, the same set of reliably inspirational words, and theological jargon that leaves outsiders bewildered. Bono, who has become more outspoken about his Christian faith in recent years, is advocating for a return to the raw and honest emotion of the Psalms. The singer’s comments in the film were part of a wide-ranging conversation he had with Eugene Peterson, a pastor and scholar who is best known for “The Message,” a translation of the Bible into contemporary language. The film documents the friendship between the unlikely pair, who were drawn together by their common interest in this ancient book of the Bible. Peterson talked about how his translation of the Psalms are as close as he could get to the original meaning of the text. Bono agreed that honesty was hard to find in modern Christian culture. In fact, he said that he found “a lot of dishonesty” in modern Christian art. This quote from Hillary Clinton reveals a devastating ignorance and why she cannot keep us safe. She will be the architect of bigger disasters than Benghazi if she is president. The following material from thereligionofpeace.com shows the inherent violence of Islam. Unfortunately, there are very few verses of tolerance and peace to balance out the many that call for nonbelievers to be fought and subdued until they either accept humiliation, convert to Islam, or are killed. Muhammad’s own martial legacy, along with the remarkable stress on violence found in the Quran, have produced a trail of blood and tears across world history. but if they desist, then lo! Allah is forgiving and merciful. And fight them until there is no more Fitnah [disbelief and worshipping of others along with Allah] and worship is for Allah alone. But if they cease, let there be no transgression except against Az-Zalimun(the polytheists, and wrong-doers, etc. )” (Translation is from the Noble Quran) The verse prior to this (190) refers to “fighting for the cause of Allah those who fight you” leading some to believe that the entire passage refers to a defensive war in which Muslims are defending their homes and families. The historical context of this passage is not defensive warfare, however, since Muhammad and his Muslims had just relocated to Medina and were not under attack by their Meccan adversaries. In fact, the verses urge offensive warfare, in that Muslims are to drive Meccans out of their own city (which they later did). Verse 190 thus means to fight those who offer resistance to Allah’s rule (ie. Muslim conquest). The use of the word “persecution” by some Muslim translators is disingenuous (the actual Arabic words for persecution – “idtihad” – and oppression – a variation of “z-l-m” – do not appear in the verse). The word used instead, “fitna”, can mean disbelief, or the disorder that results from unbelief or temptation. This is certainly what is meant in this context since the violence is explicitly commissioned “until religion is for Allah” – ie. unbelievers desist in their unbelief. Quran (2:216) – “Fighting is prescribed for you, and ye dislike it. But it is possible that ye dislike a thing which is good for you, and that ye love a thing which is bad for you. But Allah knoweth, and ye know not.” Not only does this verse establish that violence can be virtuous, but it also contradicts the myth that fighting is intended only in self-defense, since the audience was obviously not under attack at the time. From the Hadith, we know that this verse was narrated at a time that Muhammad was actually trying to motivate his people into raiding merchant caravansfor loot. Quran (9:5) – “So when the sacred months have passed away, then slay the idolaters wherever you find them, and take them captive and besiege them and lie in wait for them in every ambush, then if they repent and keep up prayer and pay the poor-rate, leave their way free to them.”According to this verse, the best way of staying safe from Muslim violence is to convert to Islam (prayer (salat) and the poor tax (zakat) are among the religion’s Five Pillars). This popular claim that the Quran only inspires violence within the context of self-defense is seriously challenged by this passage as well, since the Muslims to whom it was written were obviously not under attack. Had they been, then there would have been no waiting period (earlier verses make it a duty for Muslims to fight in self-defense, even during the sacred months). The historical context is Meccaafter the idolaters were subjugated by Muhammad and posed no threat. Once the Muslims had power, they violently evicted those unbelievers who would not convert. Quran (9:29) – “Fight those who believe not in Allah nor the Last Day, nor hold that forbidden which hath been forbidden by Allah and His Messenger, nor acknowledge the religion of Truth, (even if they are) of the People of the Book, until they pay the Jizya with willing submission, and feel themselves subdued.” “People of the Book” refers to Christians and Jews. According to this verse, they are to be violently subjugated, with the sole justification being their religious status. Verse 9:33 tells Muslims that Allah has charted them to make Islam “superior over all religions.”This chapter was one of the final “revelations” from Allah and it set in motion the tenacious military expansion, in which Muhammad’s companions managed to conquer two-thirds of the Christian world in the next 100 years. Islam is intended to dominate all other people and faiths. Quran (48:29) – “Muhammad is the messenger of Allah. And those with him are hard (ruthless) against the disbelievers and merciful among themselves” Islam is not about treating everyone equally. This verse tells Muslims that there are two very distinct standards that are applied based on religious status. Also the word used for ‘hard’ or ‘ruthless’ in this verse shares the same root as the word translated as ‘painful’ or severe’ to describe Hell in over 25 other verses including65:10, 40:46 and 50:26..
Sahih Bukhari (52:256) – The Prophet… was asked whether it was permissible to attack the pagan warriors at night with the probability of exposing their women and children to danger. The Prophet replied, “They (i.e. women and children) are from them (i.e. pagans).” In this command, Muhammad establishes that it is permissible to kill non-combatants in the process of killing a perceived enemy. This provides justification for the many Islamic terror bombings. Tabari 17:187 “‘By God, our religion (din) from which we have departed is better and more correct than that which these people follow. Their religion does not stop them from shedding blood, terrifying the roads, and seizing properties.’ And they returned to their former religion.”The words of a group of Christians who had converted to Islam, but realized their error after being shocked by the violence and looting committed in the name of Allah. The price of their decision to return to a religion of peace was that the men were beheaded and the woman and children enslaved by the caliph Ali. Ibn Ishaq/Hisham 990:- Lest anyone think that cutting off someone’s head while screaming ‘Allah Akbar!’ is a modern creation, here is an account of that very practice under Muhammad, who seems to approve. How on earth—in this perilous moment—can we elect this woman president? 2. Here—not somewhere else! Now, more than ever, Americans feel trapped in dead jobs, bad neighborhoods, and abusive relationships. Millions live wishing they were someplace else. Breathes there a young person who has not lamented that if only they could “get away from my parents I could do something great.” Hasn’t every pastor fantasized how in another church their unsung greatness would blossom? Are there times we are to relocate? Yes, but here is a common factor: You are stay where you want to leave and you end up leaving where you want to stay…but I digress. 3.Now—not someday! Here is a conversation that has never happened: God says, here’s what I want you to do. Let me know a good time to start.” Jesus said, “But Jesus said to him, “No one, having put his hand to the plow, and looking back, is fit for the kingdom of God.” Luke 9:62. What would happen if you became utterly convinced that the inner miracle that God has stored in you needs to come out no matter what? What if you completely believed that it is you, not someone else—it is here not somewhere else—it is now and not someday?